It's Wednesday and that means it's time for Danni's Flutter By Challenge! Yay! 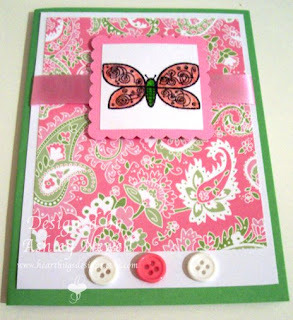 This week's twist on the challenge is to make a card with bling and buttons in addition to your butterfly. We'd love if you play along with us! If you upload to SCS or PCP please use keyword FBW44. Also, check out Danni's blog for our super special guest designer! For my card, I used Cafe Mojo's color challenge, pink and green. This is an image that Danni gave me from TAC's Retro Butterfly set. It's just so cute! I put Stickles on the butterfly but you can't really see them since I had to take my picture at night and it's totally cloudy this morning. Now, to tell you the truth, I actually made this next card for my Flutter By Challenge but forgot about the bonus challenge so I made another card. This card was made for Sunday's Featured Stamper on SCS. Here's the card I CASEd. My changes are: I fudged the layout a little bit, colors are different, and I changed the stamp set. This card is also for the Pink Elephant Challenge which was to use pink, black, and white to create a card. I love this color combo! I pieced the inside of the butterfly with pink paper and popped it up with some foam tape. I used my FAVORITE butterfly set of all time Unity's Butterfly Beauty. I stamped the same butterfly on the background paper and added some brads. Pretty easy. Have a good Wednesday my friends! Hugs! these are both incredible! i love the paisley paper on the first one - it matches that butterfly so perfectly! and the way you did the wings on the second one - awesome!!! Ashley, Your card is Lovely!! Love the raised Butterfly Wings!! Thanks so much for joining us at TPE!! WOW love BOTH of your cards - simply gorgeous! I really love the black and pink card and the paisley paper on the first!! I love those butterflies - so effective with the double image and the 3D look too. A great card. Thanks for sharing it with us at The Pink Elephant Challenge this week. Hope you'll have time to join us next week too. Wow!! I love both of these! And sneaky aren't we? LOL! 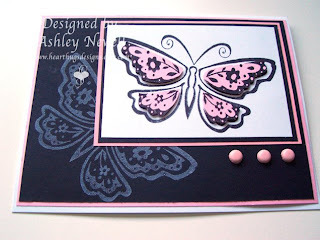 I love the butterfly on the second one and the whole design of the card! Awesome job! Ooo, great detail! Very nice. Both of your cards are fantastic!! Popping up the center of the butterfly's wings is great! Thanks so much for entering our 1st TPE challenge!! We hope to see you back again next week. They are both so pretty! Very nice cards! That second cards is BEYOND fabulous! I'm in love! Love the butterfly cards! I think the first is my favorite - that image is fun and I like the paper and colors. such beautiful pps!!! your card is gorgeous! thanks for playing along over at cafe mojo! What a sweet butterfly card! I love that pink DP! These are really beautiful!! I love them both. That Unity butterfly is really awesome! !